The Green moms are gonna get me! 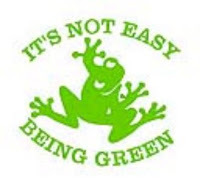 Seriously, real talk...I have been trying to get down with the being "green" thing. While I am already a big recycler and reuser of a lot of things, there are just some things I can't get down with. First off I went and purchased one of those organic and natural kitchen sponges. I got a great price for it so I figured it was worth a shot. Um, WRONG! I could not get the darn thing to make my dish soap lather so this made me waste detergent. After the first use it felt icky and slimy. I thought maybe because it was the first use that it just had to get broken in. Nope. Stayed that way for 2 weeks and made it into the trash can in a hurry! Also I tried to use recycled aluminum foil. Seriously, you get charged more for a cheap product? I was so disappointed in the quality. One great thing though is my paper plates and bowls. I LOVE LOVE LOVE them and will not trade them EVER. Sorry greenies, maybe one of the big brands will come out with a green version. Until then I will stick to most of my traditional methods that work! That's RIGHT! I don't play when it comes to bathroom tissue and paper towels. I'm right there with you. There are certain things I just can't give in on.